This week, the South African government retracted its decision to withdraw from the International Criminal Court (ICC). Last October, the Zuma administration submitted a notice of withdrawal from the ICC, citing is discontentment over the criticism received by the court as it disregarded the court’s order to detain Sudanese President Omar Hassan al-Bashir, for whom the ICC has an arrest warrant, during his visit in South Africa. Under the treaty, countries are obligated to arrest anyone sought by the court. The country has also echoed calls that the court is biased against African countries. Recently, a South African court ruled the withdrawal plan as “unconstitutional and invalid,” stating that a withdrawal from the ICC would require parliamentary approval. Tuesday, in a letter submitted to the United Nations, South Africa retracted its decision to withdraw from the ICC, citing the court ruling on the topic. 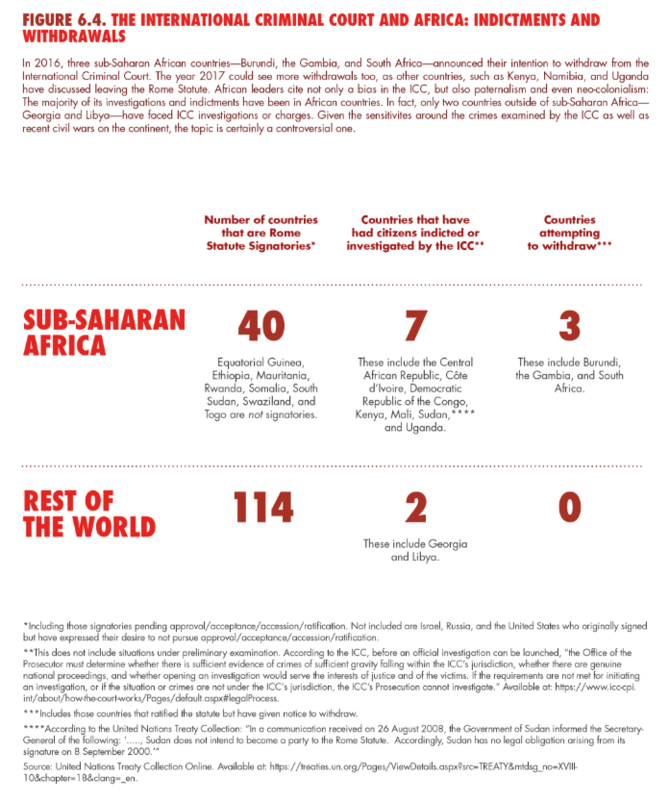 South Africa is not the first country that has aimed to withdraw from the ICC, usually citing the court’s bias against Africans. Last year, Burundi signed a bill on withdrawal from the ICC and the Gambia, under Yahya Jammeh’s leadership, withdrew from the ICC. However, President Adama Barrow, Gambia’s recently inaugurated president has since stepped back from this decision, maintaining the country’s desire to remain in the ICC, contrary to Jammeh’s decision to leave. The year 2017 could see more withdrawals too, as other countries, such as Kenya, Namibia, and Uganda have discussed leaving the Rome Statute. 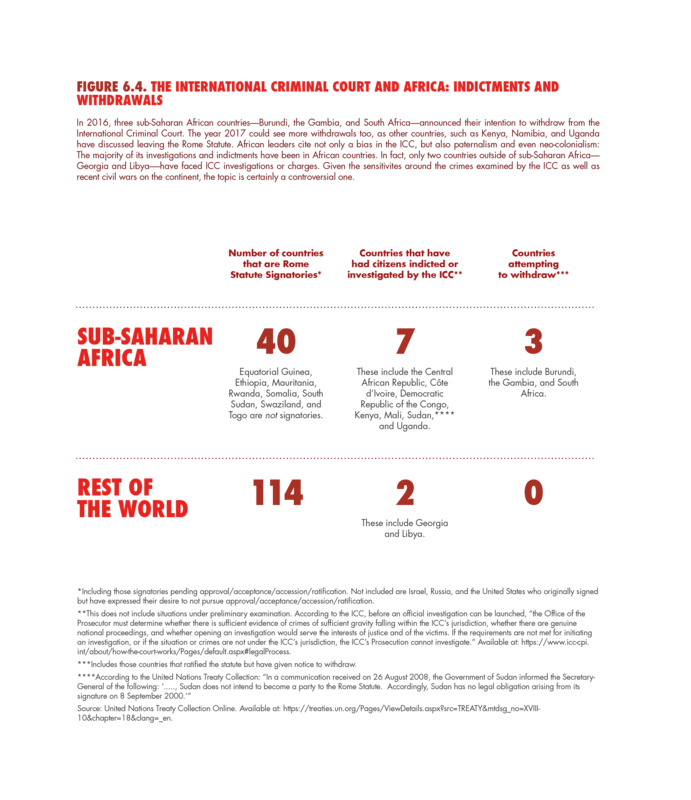 African leaders cite not only a bias in the ICC, but also paternalism and even neo-colonialism: The majority of its investigations and indictments have been in African countries. 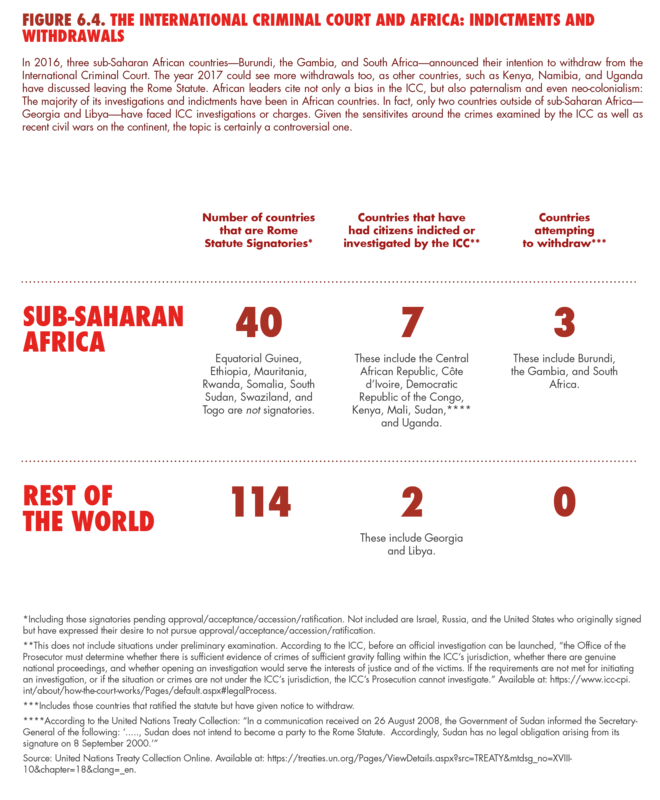 As seen in the figure below, as recently published in Foresight Africa 2017, out of the 7 countries that have had citizens indicted or investigated by the ICC, only two countries are outside of sub-Saharan Africa—Georgia and Libya. The list of indictees is extensive and includes notable politicians. Presently the ICC is trying a former head of state for the first time: The trial of former Ivorian President Laurent Gbagbo opened in late January, as he pleaded not guilty to crimes against humanity and war crimes. Given the nature of the issues examined by the ICC, as well as recent civil conflicts on the continent, many relevant debates are likely to continue for some time.